I had a very serious moment the other day. Are you ready for it? I was talking with my friend Amy about how we can’t take for granted that our kids will grow up believing truth. Our culture and our world are, as God has said they would, becoming more sinful. Yes, we want them to make the choice to believe in Jesus Christ on their own, but if we want them to have the foundation to even make that choice, we have to be intentional in teaching them. While I actively engaged in this conversation, and while I may have even looked confident as I talked about preparing my kids for their encounters with the world, my insides were turning to butter. Melted butter, to be precise. Melted butter that was sliding all over every emotional canvas within me. Pure panic rose as I began to think of what my kids might face as they grow up, and that the responsibility to teach them the truth in response to it falls to mine and Davy’s shoulders. Wonder of wonders, He has. It’s been my constant prayer for a couple of days, and the opportunities for speaking into my kids’ lives are incredible. Maybe I never noticed them before, or maybe God is just working because I’m asking Him to (or maybe both), but it’s been exciting. He’s given me some creative ideas for explaining things, too. Music. Call me weird, but I never think to put music on. It just doesn’t even cross my mind. But I’ve been putting on Sing Along Scripture Songs almost every day. It isn’t obnoxious kids music, and Micah’s been asking me what each of the songs means. Since it’s straight scripture, I’ve been able to really explain what each verse means. We had a very interesting (and insightful for me) conversation about the Fruit of the Spirit, and why he doesn’t have self control when he wants to throw a fit. Norah doesn’t understand it quite yet, but she can dance to it, and that’s all the matters to her. Sensory bins. I’m playing around with some ideas for a mom-kid Bible study, and so sensory bins are in the forefront of my mind. 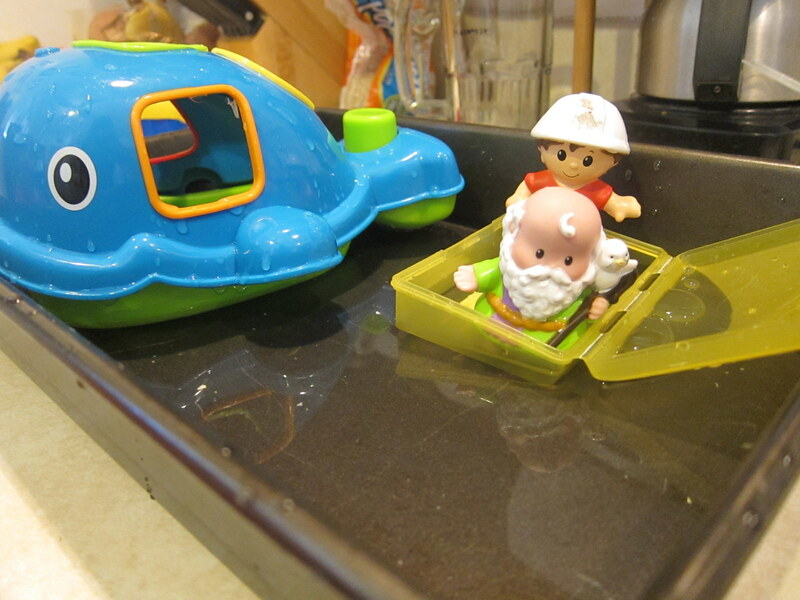 The other day Micah and I put together this Jonah sensory bin. We read the story, then we played the story. Then I read my Bible while he continued to play. He had a blast, I read my Bible, and the floor got watered, all in one day. Me: See how yucky this bucket is now? But Jesus is like this hose. He can wash us clean. He can wash away all of our sin. What do you think about that? Micah: yeah….uh, Mommy, can I see that hose for a second? Look! I’m a firetruck! Yep. Solid conversation right there. We’re probably about halfway to conversion. I let him be a firetruck at that point. Actually, it didn’t bother me because that’s not the last time we’ll talk about sin. And it’s probably not the last time we’ll play mud either. What are some of your favorite ways to share Jesus with your kids? I’d love to hear your inspirations.